The URRWMO’s activities are guided by its 10-year watershed management plan. A draft plan covering 2019-2028 is currently available for review. Agencies have already submitted comments during a 90-day review period. Those comments and URRWMO responses are in the document below. Additionally, the URRWMO invites comments from anyone at its upcoming public hearing. Following the public hearing the URRWMO will make final plan edits and submit it to the State Board of Water and Soil Resources for final approval. The URRWMO is a joint powers organization including the Cities of St. Francis, Oak Grove, Nowthen, Bethel, and portions of East Bethel. A small corner of Ham Lake also falls within the URRWMO. The WMO Board is made up of representatives from each of these cities. 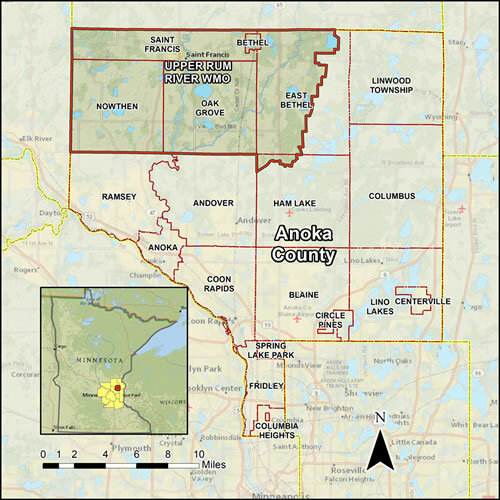 This organization seeks to maintain the quality of area lakes, rivers, streams, groundwater, and other water resources across municipal boundaries. Resources of particular importance to the URRWMO include the Rum River, Seelye Brook, Ford Brook, Cedar Creek, and numerous ditches that drain to the Rum River. This stretch of the Rum River is designated as a state Scenic and Recreational Waterway. Lake George and East Twin Lakes, the primary recreation lakes in the watershed, are also of high priority, in addition to many smaller lakes and wetlands.